According to Northern Ireland elections statistics, only 56% of registered voters in the Foyle District turned out to vote in last month's elections. As an historian of Derry, this breaks my heart a little. Look at the photo to the left. Those are real people. Historical figures, some of them, like Eddie McAteer and Bernadette Devlin McAliskey. Civil rights steward Vinnie Coyle. Others, probably, not known to me. And then the faces of the young, the hopeful, the indignant, the worried. The faces of the civil rights movement. Which -- of course -- was in large part a movement for for the right for every adult citizen to have a vote. Don't get me wrong. I celebrate the new Northern Ireland and applaud allowing the past to rest in carefully orchestrated peace. I even understand young people's befuddlement about what the Troubles were really about. And yet, this lethargy about politics strikes me as dangerous amnesia indeed. Do the young citizens of Derry know that there were no, as in ZERO, Catholic nationalist representatives in city government until after 1896? Even though the city had a Catholic population majority by 1850? And that until the 1970s, Catholics never won municipal political battles, or provincial ones for that matter? 1896 is a good example. In that year, the city's electoral wards were reorganized to limit the growing Catholic and nationalist population's voting power. Liberal MP Vesey Knox protested the new boundaries on behalf of his nationalist constituents. The city was being divided into five wards and Protestants would maintain a majority in four of them. Registered Catholic voters were being pushed into one very oddly shaped ward, and the rest of the wards would hold easy Protestant majorities. "In that Bill they were asked to set up a new code for the City of Derry, that would leave the Catholics, who were a majority of the population, with only one-fifth of the representation." Gerrymander and political disenfranchisement were codified in 1919. Again in 1922. And then in 1936. And again in 1948. 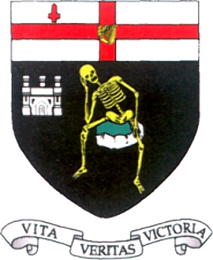 People used to joke that the seal of the city was a Catholic waiting for a job. It might as well have been a Catholic waiting for the right to vote. And while the political machinations of electoral politics always held some fear that nationalists would sell out their unionist neighbors, that a nationalist majority would see Derry go to hell in a Donegal-woven hand basket, the fight for voting rights in Derry was always as much about jobs, economic development and especially -- housing -- as they were about national identity and the border question. And all along, there were fighters. The Derry Catholic Registration Association --- formed in the early twentieth century to make sure every Catholic eligible to vote could and did. The Irish Action Party, the Irish Anti-Partition League. Eddie McAteer, James Doherty, Paddy Friel, Frank McAuley, Paddy and Eileen Doherty. By 1968, reigning nationalist leader in Derry, Eddie McAteer, articulated the ways voting, employment and access to housing had all come together in the civil rights movement when he addressed the Minister of Home Affairs at Stormont on March 7th, 1968. I am very much troubled about the age groupings of the people who are involved in recent prosecutions. They are not the teenage, out-for-excitement type; they are mature people who feel they are being denied their basic rights…I should like to warn the government that they are pressing the spring to a dangerous point. I am conscious of the seriousness of the words I am using. It is only because I can smell sulfur in the air that I think the government and the House as a whole should be alerted. There is a problem here…we are rushing into a very dangerous situation and it behooves us as a people of common sense to do our best to avert what might very well be a permanent catastrophe to community relations. Premonition indeed. 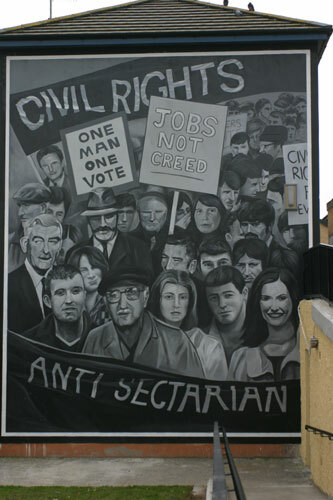 The civil rights movement bled directly into the Troubles. A generation's struggle for the right to represent themselves politically ushered in thirty years of civil war. Voting rates in Northern Ireland have been dropping since 1998 and the Good Friday Agreement. It is, in so many ways, little different than in the Republic, the UK, Canada, the United States. I also understand what Pol O'Muiri calls the "boredom, frustration and anger" nationalists have when it comes to business as usual at Stormont. And Derry is in many ways a nationalist city. The old struggles are over. Next time, Derry, go out and vote. If not for yourselves, do it for them. “Municipal Franchise Bill (Ireland),” 12 June 1895, Hansard Parliamentary Debates, vol. 35, cols. 62-74. I find this equally depressing. I understand a desire to escape the past, to get away from the trauma. I am curious about the breakdown of voters. Is it the kids who aren't voting? Or is it the boomers? And yes, I also can't help but think of another population long denied the right to vote, African Americans. Interestingly, here in the US, African Americans do, when all things are equal, vote in higher numbers than white Americans. Of course, things are never really all that equal, as Alabama proves over and over again.